Steven is from Green Cove Springs, FL and graduated from the U.S. Air Force Academy in 2013 with a B.S. in History. 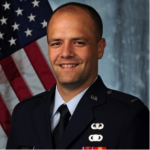 After commissioning, he became a Contracting Officer and was assigned to Joint Base Andrews, MD. In the summer of 2016 he deployed to Camp Lemonnier, Djibouti where he served as the Contract and Finance Flight Chief for the 726 Expeditionary Air Base Squadron. He will graduate from George Mason University in 2017 with a Master of Public Policy with an emphasis on Government Institutions and Policy Management. He will attend the University of Virginia School of Law following the completion of his Air Force commitment.